Download and print instructions for all bracelet patterns included here. Embroidery floss is a staple cross stitch supply, but you can also use it to create beautiful bracelets for all ages. If you know how to tie a knot, you're well on your way to mastering the basic bracelet pattern. With practice you'll soon be able to make all kinds of different designs. The only supplies needed for this craft are various colors of embroidery floss and something to secure them with, such as tape or a safety pin, and a pair of sharp scissors. 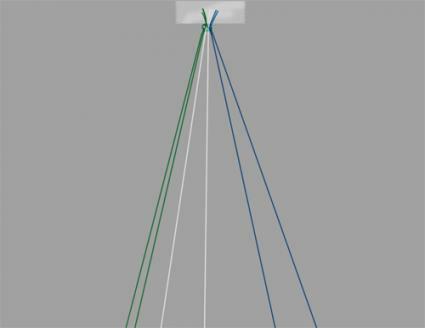 Measure and cut six equal lengths of floss, two of each color. The length will vary depending on how long you want the finished bracelet to be. Use three-foot long strands for a standard size bracelet. Tie the ends of the strands together, leaving about two and a half to three inches of overhanging thread. When you finish the bracelet, tie the ends together and trim off the excess thread. Alternatively, measure one strand of each color, but double the length. So for a standard bracelet each strand of floss will be six feet long. Fold the strands in half and tie them together at the looped ends, leaving a loop at the top. When you've finished your bracelet, divide the strands from the finished end into two groups and tie them around the loop, trimming any excess thread. Use tape to secure the knotted end to a table, heavy book, or other stable object. Use a safety pin and pin the knot to your pants, just above the knee, with the strands facing towards you. This way you can work while seated, with your knee up. Clip the knot to a clipboard. Separate the strands by color, for example two green, then two white, then two blue. Pull them straight. Take the next strand with the fingers of your left hand, and with your right hand pull the end of the first strand under and through the loop. Pull the first strand straight up to the top of the bracelet to make a knot. Tie two knots on each strand, working from left to right. Continue repeating this step, and soon you'll start to see your striped pattern emerging. When the bracelet reaches the right length for your wrist, tie off the end. Wrap the bracelet around your wrist and tie it securely. A chevron pattern looks like arrows all pointing in the same direction. To create this pattern on an embroidery floss bracelet, you're basically making two different bracelets in opposite directions and tying them together in the middle. To make a backwards knot for this and other patterns, work from right to left instead of left to right. Place the right thread over the left and loop it under the left thread, pulling it up to secure the knot. Use an even number of strands in contrasting colors. Measure, cut, and tie the strands as you would for the basic bracelet. With the first three strands, tie a row of double knots as you would for a basic bracelet. Now, starting on the right-hand side and working from right to left, tie the next three strands in double backward knots, working towards the middle. Tie the center strands, which should be the same color, together in two forward knots. Repeat steps 3 through 5 until the bracelet is your desired length. Tie off the bracelet as you would for the basic pattern. A bordered chevron pattern features chevron lines with a solid color border along both edges. Measure, cut, and tie your floss as you would for the basic bracelet, but this time make the color you've chosen for the border several inches longer than the others. Arrange the strands in the same pattern as the chevron bracelet, with your border colors on the outside. Starting on the left, tie one forward and one backward knot onto the second strand. Repeat on the right side. Leaving your border colors aside, tie the next row as you would for a regular chevron bracelet. Repeat steps 3 and 4 until the bracelet is the right length. 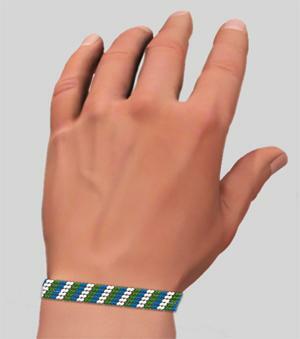 A zigzag friendship bracelet is patterned the same as a basic one, but the bracelet itself forms a wavy line. Measure, cut, and tie your strands as you would for a basic bracelet. Arrange the strands by color, for example AABBCC. Working from left to right, start tying as you would for a basic bracelet. When you get to the sixth strand, tie the row normally until you reach the last strand. Then, tie one forward and one backward knot. 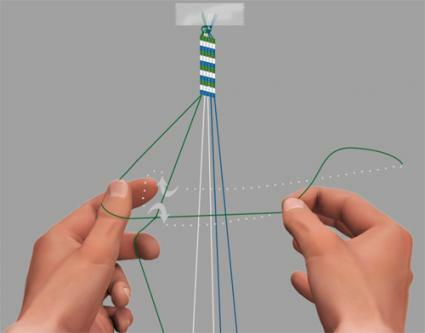 Now, working from right to left, continue tying the bracelet in backward knots until you cycle through the colors again. Repeat steps 3 through five until the bracelet is the right length. Tie off the bracelet as you would in the basic pattern. Making a friendship bracelet with a heart pattern is a little tricky at first, but once you get started you'll pick it up fairly quickly. 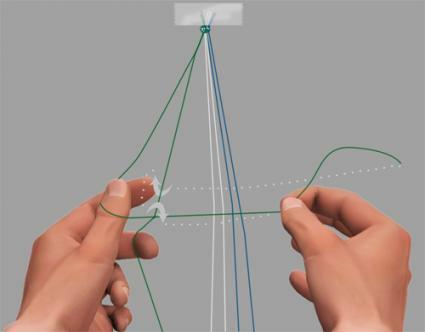 Measure, cut, and tie eight strands of floss. You'll want four strands each of two contrasting colors. Arrange the strands in an ABAB BABA pattern. Tie the first two rows as you would for a chevron bracelet. Make a forward knot with the strand on the far right and a backward knot on the far left. The color pattern should now be BAAB BAAB. Leaving the outermost strands aside, tie the next row in a chevron line. Tie the second strand on the right in a backward knot under the outside strand. Repeat this on the left, tying the second strand over the outside strand. The color pattern should now be ABBA ABBA. Repeat step 5. The color pattern is now ABAB BABA, as it was when you started. Repeat steps 3 through 7 until you reach your desired length for the bracelet. Tie off the bracelet as you would for all other patterns. One of the fun things about making friendship bracelets is choosing the colors for your work. Here are some suggestions to select the perfect color schemes. Use bold shades from the same color family, such as red, orange, and yellow, for eye-popping patterns. Using the color wheel, select opposite shades such as purple and yellow or blue and orange for contrast. Pick soft pastel shades like pink, baby blue, and lavender for a more subdued pattern. Make holiday bracelets in red, white, and green for Christmas or orange and black for Halloween. Choose your school colors or those of your favorite sports team. Use a strand or two of white or black in your color scheme to anchor the brighter colors. You can vary the width of your bracelets by using more strands to make them wider, or fewer strands to make them narrower. You can also vary the width of the stripes on a basic or chevron bracelet by grouping extra strands of the same color together. Work slowly and carefully, making sure each knot is secure. It's very difficult to untie knots without unraveling the floss. Embroidery floss is inexpensive and can be found at most craft stores. You can also find it at many dollar stores, usually at two or three skeins for a dollar. Friendship bracelets made from embroidery floss are fun to wear and last for a long time, even through showers and swimming. Design some for yourself in your favorite patterns, or create them for friends and family. These bracelets make thoughtful handmade gifts, especially when they're custom designed in the recipient's favorite colors.